Sundancer Backpackers Hostel.. backpacking, is it for you? It will be interesting to see how many of you have traveled the world staying in backpacker hostels and what the experience was like? I never did and now it's a bit too late, when I do brave-up and take to the air if when I reach my destination I don't like to share my bedroom/bathroom space with anyone I don't know :) The Sundancer Backpackers Hostel located in a heritage building on High Street, big plus, in Fremantle gets good reviews, if you're interested have a look inside here. Oh to be young and adventurous again! Happy Wednesday, take care and stay safe..
Click here to see more Monday Murals from around the world.. .
With less than a week to go until official winter in Australia here in Perth we still have temps in the 20C's but... with the possibility of rain on the 1st of the month.. we will see. Meanwhile our native and European bees are super busy here in the autumn/winter flowering gums preparing for the colder months ahead.. it's a competition in the flowering trees and bushes between the birds and the bees, both after the same sweet prize! You just know I'm going to have to say it.. hope you have a 'bee'utiful Sunday, I know right :) Take care and stay safe..
...on their way to the city :) Happy weekend, take care and stay safe. Aimee came dashing in after work on Wednesday to say there were signs of a fabulous sunset on the coast five minutes from home.. 'quick, grab your camera, let's go'. Phew! We got there with five minutes to spare! Check out what's in the background there.. the lighthouse at Hillarys Boat Harbour all wrapped up for restorations. Will come down and take some pics when fini but as Aimee pondered what will guide the ships out to sea now? Do you remember this shot where it was guiding in a UFO :) Below the colours just before the sun sinks below the horizon..
... and after. Probably not the most dramatic sunset I've ever seen, but nice all the same. Happy Friday, take care and stay safe..
how unlonely being alone can be"... Ellen Burstyn. The weather has taken a turn for the better worse.. rain, rain and more rain, j'adore! Not many brave enough to swim but there's always someone! More of the same tomorrow might give me the chance to catch a few rare umbrella shots.. hopefully :) Happy Wednesday, take care and stay safe... P.s. I hope you like this image as much as I do. I had an unexpected delightful surprise when in South Perth yesterday! The South Perth foreshore has had a fabulous upgrade over the last few years and it's always a treat to walk along and view the city from the other side of the Swan River. I was there to see if a particular view of the city from under the Narrows Bridge would make a good image for a new header shot when I spotted the head above pop out of the water..
What an experience for the stand-up board rider below, there were at least three dolphins that I could see cavorting around his board.. he did pull out a camera. I would have loved to see those close-up shots! It's the old which came first the chicken or the egg conundrum! I'm not sure which came first the paste-up of the hungry bee pleading for plant sustenance or the ironically flowery mural below? Did the mural artist even notice the plea! You can see in the two shots below how tiny the paste-up, to the right of the door, is. In the last shot which I took first I didn't even realise it was there! Neither were signed but it's a plea worth mentioning and one that I personally heeded, planting two new flowers over the weekend.. in the rain! The change-over to Windows 10 went remarkably smoothly I thought, although the 'Grace you're a nightmare' comments from P might be an indication that it wasn't as smooth for him :) Happy Monday, take care and stay safe.. Above reflections of the city caught in the windows of the Perth Convention and Exhibition Centre ballroom and below reflections of the Exhibition Centre and South Perth foreshore. Looks like we're in for a wet weekend here in Perth which is good.. also I've decided to make the momentous, for me, move up to Windows 10 which could be bad, it could get a wee bit tense around here as I'm not good with change, hoping for a smooth transition :) Happy weekend, take care and stay safe... P.s. are you are with Windows 10 and was it an easy switch? What is it with clowns and the fear factor! I admit to having many many phobias.. flying, deep water, small spaces, spiders, bike helmets etc. but never clowns. Passing the Claremont Showground yesterday and seeing the gate open I thought I'd see if I could get a scary clown shot in the royal show fairground area. This area during show week is packed to overflowing but at this time of the year deserted. I thought that might help with the creepy feel but with skies of blue and not an ominous cloud in sight it was tricky. I did what I could.. what do you think, did the shot above send chills down your spine :) Happy Thursday, take care and stay safe.. P.s. Trypophobia, I have that too :) P.p.s. 'fess up, what are some of your fears! Narc Dive Club Underwater and Land Cleanup 2017.. It's been a while since PDP has had a guest post, the perfect opportunity presented itself when Diver Bill, who prefers catching crayfish to taking photos these days :) took part in the seventh annual Narc Dive Club Underwater and Land Cleanup 2017, this year held on Rottnest Island 18km off the coast of Fremantle. 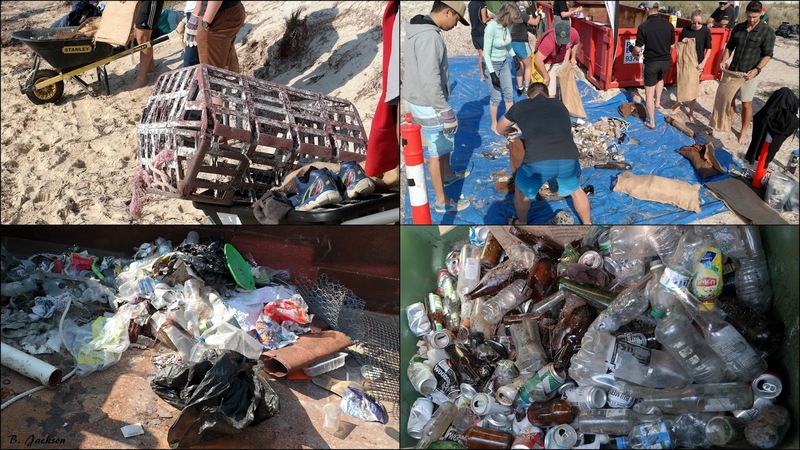 Observed by curious quokkas, over 100 divers and land helpers gathered on the beach to begin the clean-up created by planet earths most dangerous species.. man! Associated with Sea Shepherd, Narc relies on sponsorship to organise the clean-up, with support coming from the ferry companies, businesses on and associated with Rottnest..
Last weekend's event was cut to one day due to bad weather and the haul of 790 kgs, the smallest weight haul ever, was a 'hats off to the Rottnest Island Authority, surrounding businesses and water users'. Meanwhile check out last year's haul.. 10.3 tonnes, that's right 10.3 tonnes pulled out from Fremantle Harbour, check the link.. you won't believe what was pulled up. Seriously what is wrong with people.. for goodness sake hire a trailer and take your rubbish to the tip! Littering is one of my all time pet hates grrrr! Merci beaucoup Bill for the photos and for participating in such a worthwhile event.. and for the super cute photo of the quokka :) Happy Wednesday, take care and stay safe.. P.s. I can't even imagine just tossing rubbish into the environment like this can you! Open plan for mother's day.. The food too is finger licking good, see above! There's something wonderfully comforting about toasties and hot coffee when the weather turns and there is a slight chill in the air. Toasties filled with ham, dijon, oozing with cheese and did I mention the rosemary and parmesan butter, as the French would say.. miam! Happy Mother's Day from Perth..
Art Deco reflected in Art Deco.. When all else fails.. join the circus! Weekend reflections.. what's in a name? I died and went to Art Deco Heaven..
Could've missed him.. but didn't! Panda & Co.. Let's eat!